hey this one is definitely in my favs. its absolutely gorgeous and has a sense of mystery, tranquility and sweetness to it. excellent work! 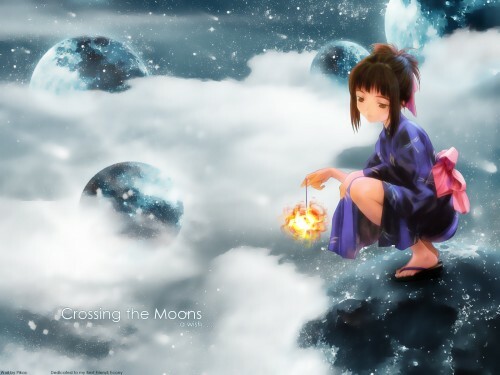 I totally love the atmosphere of this wallpaper, and how the girl is highlighted. Great "tranquil" atmosphere, definitely a saver. this is what a call a dream scene picked right out of my head. can it get better? Lovely wallpaper. I love the bg and the chara is really sweet. I dunno if it's just me, but it looks like you used the smart blur filter a little too much on the moons and clouds. I strongly suggest smoothing them out (with the smudge tool) to give them a painted look. Quote by Chloe-chanI dunno if it's just me, but it looks like you used the smart blur filter a little too much on the moons and clouds. .
in INCREDIBLE proportions, the whole wallpaper is made out using the smart blur, I mean, even if you really created the background out of nothing you ended up damaging it because now inteast of a painty look you got a very fake feeling...like chloe chan I also suggest to use the smudge tool to make it smoother and maybe a texture also just to make it looks more attracting. well, what i wanted with this wall was not really a painted look, and it perhaps doesn't have it even, what i wanted was that the bg to look a little soft from what the actual backgroung looked, and i think i managed to do that, and i don't think i need to put textures in it, even though the cloudy portions looks all plain, i am really satisfied with the overall wall. by the way, the scan was from Dengeki Hime, drawn by Nagomi Hiyori. It is your careful use of blur and i can see, a few grunge brushes that blow my mind away ! Your Clouds and mists are nicely done from my point of view. Nobody is perfect. And we all are nobodies. So , practise, practise, practise ! xD It takes a team to get it perfect on the first try. And wow, I love your Planetoids lots too. amazing wallpaper, it looks briliant and I love details of this sky. Charakter looks so cute... I like this style of background. Well done! My favorite part of this image, besides the moons, clouds like waves, and the stars... is the character. The wallpaper has a crispness to it but is smooth, and the blur on the character is at a unique amount that makes her look soft without making me want to go get my prescription checked. +fav... great work on this one! I havent seen i image like this in a long time. Nice Wallie u have there.. I particularly like the bg as it gives out a nice ambient..